Rainwater harvesting is gathering the excess rainwater from houses with a specific end gol to store it for later use. Generally, the activity includes harvesting the rain from a rooftop. The rain will gather in raingutter, then it will all flow towards a rainwater tank. Rainwater tanks can vary in size. Did you know that in a 1' inch rain, you can harvest 600 gallons of water off of a 1000 sq. foot roof? That means in most areas of san diego, if you assume a 2000 sq ft house, we all have the potential to store, 12,000 gallons of water per year! That's a lot of water! 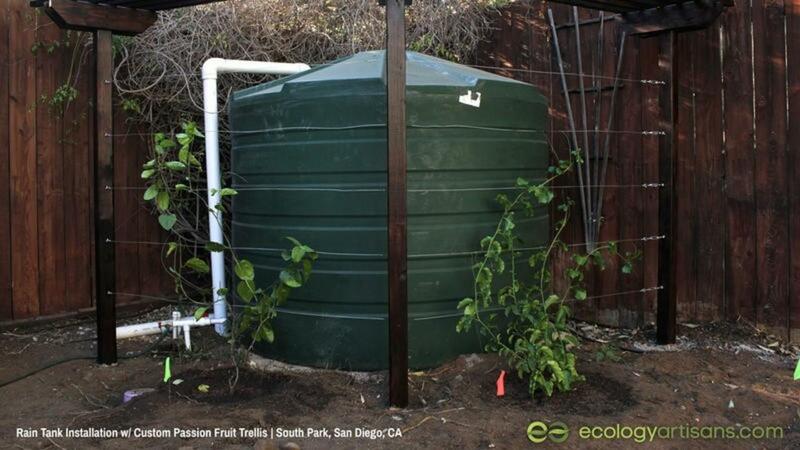 We often don't recommend using 50 gallon rainwater barrels because they fill up so quickly. If you are going to harvesting rainwater, let's take it seriously. Even a small house has a huge potential, so let's size our tanks appropriately.